Natural Resources Conservation Service, 1939. IN 1938 and 1939, Dr. W. C. Lowdermilk, who was an assistant chief of the U. S. Soil Conservation Service at that time, made an 18-month tour of western Europe, North Africa, and the Middle East to study soil erosion and land use in those areas. This tour was sponsored by the Soil Conservation Service at the request of a congressional committee. The main objective of the tour was to gain information from those areas -- where some lands had been in cultivation for hundreds and thousands of years -- that might be of value in helping to solve the soil erosion and land use problems of the United States. During the l938-39 tour, Dr. Lowdermilk visited England, Holland, France, Italy, Algeria, Tunisia, Tripoli, Egypt, Palestine, Trans-Jordan, Lebanon, Cyprus, Syria, and Iraq. Prior to that time, he had spent several years in China where he had studied soil erosion and land use problems. After his return to this country, Dr. Lowdermilk gave numerous lectures, illustrated with lantern slides, about his findings on land use in the old world. Conquest of the Land Through Seven Thousand Years is the essence of those talks. It was first published in l942, in mimeograph form, as a lecture. It has been used extensively in conjunction with lantern slides by many school teachers and other lecturers. It proved to be so popular that it now has been slightly revised and illustrated, and is published in its present form with the hope that its usefulness will be greatly extended. Most of the illustrations used in this publication were made from photographs taken by Dr. Lowdermilk during his travels. Some time ago I heard of an old man down on a hill farm in the South, who sat on his front porch as a newcomer to the neighborhood passed by. The newcomer to make talk said, "Mister, how does the land lie around here?" The old man replied, "Well -- I don't know about the land a-lying; it's these real estate people that do the lying." In a very real sense the land does not lie; it bears a record of what men write on it. In a larger sense a nation writes its record on the land, and a civilization writes its record on the land -- a record that is easy to read by those who understand the simple language of the land. Let us read together some of the records that have been written on the land in the westward course of civilization from the Holy Lands of the Near East to the Pacific Coast of our country through a period of some 7000 years. Records of mankind's struggles through the ages to find a lasting adjustment to the land are found written across the landscapes as "westward the course of empire took its way." Failures are more numerous than successes, as told by ruins and wrecks of works along this amazing trail. From these failures and successes we may learn much of profit and benefit to this young nation of the United States as it occupies a new and bountiful continent and begins to set up house for a thousand or ten thousand years -- yea, for a boundless future. Pearl Harbor, like an earthquake, shocked the American people to a realization that we are living in a dangerous world -- dangerous for our way of life, for our survival as a people, and perilous for the hope of the ages in a government of the people, by the people and for the people. Why should the world be dangerous for such a philanthropic country as ours? The world is made dangerous by the desperation of peoples suffering from privations and fear of privations, brought on by restrictions of the exchange of the good and necessary things of Mother Earth. Industrialization has wrought in the past century far reaching changes in civilization, such as will go on and on into our unknown future. Raw materials for modern industrialization are localized here and there over the globe; they are not equally available to national groups of peoples who have learned to make and use machines. Wants and needs of food and raw materials have been growing up unevenly and bringing on stresses and strains in international relations that are seized upon by ambitious peoples and leaders to control by force the sources of such food and raw materials. Wars of aggression, long and well planned, take place to obtain such materials. Such conflicts are not settled for good by war; the problems are pushed aside for a time only to come back in more terrifying proportion at some later time. Lasting solutions will come in another way. We can depend on the reluctance of peoples to launch themselves into war, for they go to war because they fear something worse than war, either real or propagandized. A just relation of peoples to the earth rests not on exploitation, but rather on conservation -- not on the dissipation of resources, but rather on restoration of the productive powers of the land and on access to food and raw materials. If civilization is to avoid a long decline such as has blighted North Africa and the Near East for 13 centuries and for centuries yet to come, society must be born again out of an economy of exploitation into an economy of conservation. We are now getting down to fundamentals in this relationship of a people to the land. My experience with famines in China taught me that in the last reckoning all things are purchased with food. This is a hard saying; but the recent worldwide war shows up the terrific reach of this fateful and awful truth. Aggressor nations used the rationing of food to subjugate rebellious peoples of occupied countries. For even you and I will sell our liberty and more for food, when driven to this tragic choice. There is no substitute for food. Seeing what we will give up for food, let us look at what food will buy -- for money is merely a symbol, a convenience in the exchange of the goods and services that we need and want. Food buys our division of labor that begets our civilization. Not until tillers of soil grew more food than they themselves required were their fellows released to do other tasks than the growing of food -- that is, to take part in a division of labor that became more complex with the advance of civilization. For the lumberjack does not go into the forest to cut and log out timber until food is made available, nor do miners dig the ore out of the bowels of mountains, nor mechanics fashion metals into tools and machines, nor soldiers fight battles until food is made abundant and adequate. True, we have need of clothing, of shelter, of other goods and services made possible by a complex division of labor founded on this food production when suitable raw materials are at hand. And of these the genius of the American people has given us more than any other nation ever possessed. They comprise our American standard of living. But these other good things matter little to hungry people as I have seen in the terrible scourges of famine. Food production is thus the final and fundamental measure of adjustment of a people to its land resources. Food production is the measure of the carrying capacity of the land for a human population, but the multiplicity in divisions of labor determines our standards of living. Trade and transportation permit concentration of peoples in cities and certain countries beyond the food producing capacity of the underlying land, but this in no way invalidates this basic relation of a people to the earth. Food comes from the holy earth. The land with its waters gives us nourishment. The earth rewards richly the knowing and diligent but punishes inexorably the ignorant and slothful. This partnership of land and farmer is the rock foundation of our complex social structure. In 1938, in the interests of a permanent agriculture and of the conservation of our land resources, the Department of Agriculture asked me to make a survey of land use in olden countries, for the benefit of our farmers and stockmen and other agriculturists in this country. This survey took us through England, Holland, France, Italy, North Africa, and the Near East, and after 18 months was interrupted by the outbreak of war when Germany invaded Poland in September of 1939. We were prevented from continuing the survey through Turkey, the Balkan States, Southern Germany, and Switzerland as was originally planned. But in a year and a half in the olden lands we discovered many things of wide interest to the people of America. We shall begin our reading of the record as it is written on the land in the Near East, where civilization arose out of the mysteries of the Stone Age and gave rise to cultures that moved eastward to China and westward through Europe and across the Atlantic Ocean to the Americas. We are daily and hourly reminded of our debt to the Sumerian peoples of Mesopotamia, whenever we use the wheel that they invented more than 6000 years ago; we do homage to their mathematics each time we look at the clock or our watches to tell time divided into units of sixty. Moreover, our calendar in use today is a revision of the method of the ancient Egyptians in dividing the year. We inherit the experience and knowledge of the past more than we know. Agriculture had its beginnings at least 7000 years ago and developed in two great centers -- in the fertile alluvial plains of Mesopotamia and the Nile Valley. We shall leave the interesting question of the precise area in which agriculture originated to the archaeologists. It is enough for us to know that it was in these alluvial plains in an arid climate that tillers of soil began to grow food crops by irrigation in quantities greater than their own needs and released their fellows for a division of labor that gave rise to what we call civilization. We shall follow the vicissitudes of peoples recorded on the land, as nations rose and fell in these fateful lands. Ruins of Kish, one of the world's most important cities 6,000 years ago. Recently archaeologists excavated these ruins from beneath the desert sands of Mesopotamia. A survey of such an extensive area in the short time of two years called for simple but fundamental methods of field study. With the aid of agricultural officials of other countries, we hunted out fields that had been cultivated for a thousand years, or the basis of a permanent agriculture. Likewise, we sought to find the reasons why lands formerly cultivated had been wasted or destroyed, as a warning to our farmers and our city folks of a possible similar catastrophe in this new land of America. A simplified method of field study enabled us to examine large areas rapidly. In the Zagros Mountains that separate Persia from Mesopotamia, shepherds with their flocks have lived from time immemorial, when "the memory of man runneth not to the contrary." From time to time they have swept down into the plain to bring devastation and destruction upon farming and city peoples of the plains. Such was the beginning of the Cain and Abel struggle between the shepherd and the farmer, of which we will have more to say. At Kish, we looked upon the first capital after the Great Flood that swept over Mesopotamia in pre-historic times and left its record in a thick deposit of brown alluvium. The layer of alluvium marked a break in the sequence of a former and a succeeding culture as recorded in artifacts. Above the alluvium deposits is the site of Kish, the first capital in Mesopotamia after the traditional flood as described in the Bible. That which no king before had done, I did ... A wall like a mountain that cannot be moved, I builded ... great canals I dug and lined them with burnt brick laid in bitumen and brought abundant waters to all the people ... I paved the streets of Babylon with stone from the mountains ... magnificent palaces and temples I have built ... Huge cedars from Mount Lebanon I cut down ... with radiant gold I overlaid them and with jewels I adorned them. 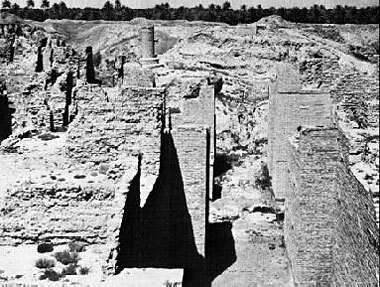 Ruins of the famous stables of Nebuchadnezzar in Babylon built during the sixth century B.C. Babylon died and was buried by the desert sands, not because it was sacked and razed but because the irrigation canals that watered the land that supported the city were permitted to fill with silt. Then came to mind the warnings of the Hebrew prophets that were thundered against the wicked city, for they warned that Babylon would become "A desolation, a dry land, and a wilderness, a land wherein no man dwelleth ... And wolves shall cry in their castles, and jackals in the pleasant places." Believe it or not, the only living thing that we saw in this desolation that once was Babylon, was a lean gray wolf, shaking his head as if he might have had a tick in his ear, as he loped to his lair in the ruins of one of the seven wonders of the ancient world -- the Hanging Gardens of Babylon where air conditioning was in use 2600 years ago. Mesopotamia, the traditional site of the Garden of Eden, out of which come the stories of the Flood, of Noah and the Ark, of the "Tower of Babel" and the confusion of tongues, of the fiery furnace which we found still burning today, is jotted full of records of a glorious past, of dense populations and of great cities that are now ruins and desolation. For at least eleven empires have risen and fallen in this tragic land in 7000 years. It is a story of a precarious agriculture by people who lived and grew up under the threat of raids and invasions from the denizens of grasslands and the desert, and of the failure of their irrigation canals because of silt -- silt! In recent years a great pool of oil was discovered beneath the traditional Garden of Eden. It was escaping gas from this pool that caught fire and became known as the fiery furnace into which, presumably, the three friends of Daniel, Shadrach, Meschech and Abednego, were thrown by an angry King. Income from this rich find of petroleum may well be used to restore this ancient land to more than its former productivity by installations of modern civilization. Scarcely a beginning in this possible reclamation has been made. In Mesopotamia, agriculture was practiced in a very dry climate on canal irrigation with muddy water. Waters of the Twin Rivers are now heavily charged with the products of erosion out of far mountain gorges and overgrazed hill lands, of the Tigris and Euphrates drainage. This muddy water was the undoing of empire after empire by reason of silt. As muddy river waters slowed down, they choked up the canals with silt. It was necessary to keep this silt out of the canals year after year to supply life-giving waters to farm lands and to cities of the plain. As populations grew, canals were dug further and further from the rivers, until a great system of canals called for a great force of hand labor to keep them clean of silt. This was a very serious problem, for the rulers of Babylon brought in war captives for this task. Now we understand why the captive Israelites "sat down by the waters of Babylon and wept," for they also were doubtless required to dig silt out of the canals of Mesopotamia. As these great public works of cleaning silt out of canals were interrupted from time to time by internal revolutions and by foreign invaders, the peoples of Mesopotamia were brought face to face with disaster in canals choked with silt. Stoppage of canals by silt depopulated villages and cities more effectively than the slaughter of people by an invading army. On the basis of an estimate that it was possible in times past to irrigate 21,000 square miles of the 35,000 square miles of the alluvium of Mesopotamia, the population of Mesopotamia at its zenith was probably between 17 and 25 million. The present population of all Iraq is estimated to be about 4,000,000 including nomadic peoples. Of this total not more than 3,500,000 live on the alluvial plain. Decline in population in Mesopotamia is not due to loss of soil by erosion; for the fertile lands are still in place and life-giving waters still flow in the Tigris and Euphrates Rivers, ready to be spread upon the lands today as in times past. Mesopotamia is capable of supporting as great a population as it ever did and greater when modern engineering makes use of reinforced concrete construction for irrigation works and powered machinery to keep canal systems open. A greater area of Mesopotamia thus might be farmed than ever before in the long history of this tragic land. But erosion in the hinterlands aggravated the silt problem in waters of the Twin Rivers, as they were drawn off into the ancient canal systems, and invasions of nomads out of the grasslands and the desert brought about the breakdown of irrigation that spelled disaster after disaster. We shall leave Mesopotamia now where at least 11 empires rose and fell in the past 7000 years and where the 12th nation of Iraq is now just beginning a new life. We shall travel westward across the Syrian desert, along the probable route of the patriarch Abraham with his family, as he journeyed from Ur of the Chaldeas to the Promised Land of Canaan. We had selected for our survey of Mesopotamia, a period that would fall after the usual spring rains and before the sandstorms of late spring. But we were overtaken by a belated rain and became stuck in the mud. We owe our rescue to the kindness and efficiency of employees of the Iraq Petroleum Pipe Line Company which was engaged in pumping oil out of the great pool under the Garden of Eden to the Mediterranean Coast, in two pipe lines each more than 600 miles long. Let's now turn to the other great center of population growth and development of civilization in the Valley of the Nile, where the mysterious Sphinx ponders problems of the ages as he looks out over the narrow green valley of the Nile lying across a brown and sun-scorched desert. In Egypt as well as in Mesopotamia tillers of soil early learned to sow food plants of wheat and barley and to grow surplus food that released their fellows for divisions of labor that gave rise to the remarkable civilization that arose in the Valley of the Nile. Our debt to the ancient Egyptians is great. Here farming grew up with flood irrigation of muddy water where problems of farming were quite different from those of Mesopotamia. Annual flooding with silt-laden waters spread thin layers of silt over the land, raising it higher and higher. In these flat lands of slowly accumulating soil, farmers never met with problems of soil erosion. To be sure, there have been problems, especially since year-long irrigation has been made possible by the Assuan Dam, of salt accumulation and of rising water tables for which drainage is the solution. But the body of the soil has remained suitable for cropping for 6000 years and more. We shall follow the route of Moses out of the fertile irrigated lands of Egypt into a mountainous land where forests and fields were watered with the rain of heaven. Fields cleared on mountain slopes presented a new problem in farming -- the problem of soil erosion, which as we shall see, became the greatest hazard to permanent agriculture and an insidious enemy of civilization. We crossed the modern Suez Canal with its weird color of blue, now a very important "big ditch," into Sinai where the Israelites with their herds wandered for 40 years. They or some one must have overgrazed the Peninsula of Sinai, for it is now a picture of desolation. We saw in this landscape how the original brown soil mantle was eroded into enormous gullies as shown by great yellowish gashes cut into the brown soil covering. I had not expected to find evidences of so much accelerated erosion in the arid land of Sinai. On the way to Aqaba we crossed a remarkable landscape, a plateau that had been eroded through the ages almost to a plain, called a peneplain in physiographic language. This broad flat surface glistened in the sunlight with the colors of the rainbow because of desert varnish on the small stones that had been fitted together through the ages to form a classic example of desert pavement. This peneplain surface dates back to Miocene times, in the geological scale. In the plain now is no evidence of accelerated cutting by torrential streams, no evidence that climate has changed for drier or wetter conditions since Miocene times. Here is a cumulative record going far back of the Ice Age, proclaiming that in this region climate has been remarkably stable. From this plateau we dropped down 2500 feet into the Araba or gorge of the great rift valley that includes the Gulf of Aqaba, the Araba, the Dead Sea, and the Valley of the Jordan. At the head of the Gulf of Aqaba of the Red Sea we found Dr. Nelson Glueck excavating Ezion Geber which he calls the ancient Pittsburgh of the Red Sea, or Solomon's Seaport, where copper was smelted 2800 years ago to furnish instruments for Solomon and his people. The mud brick used for building these ancient houses looked just like our adobe brick of New Mexico and Arizona. As we climbed out of the rift valley over the east wall to the plateau of Trans-Jordan that slopes toward the Arabian Desert, we came near Amman upon the same type of peneplain that we crossed west of the Araba. This peneplain was covered by a coarser pavement in which were fragments of basalt, but topographically these two plains are parts of the same peneplain that once spread unbroken across this region. But toward the end of Pliocene times -- that is, just before the beginning of the Ice Age -- a series of parallel faults let down into it the great rift valley to form one of the most spectacular examples of disturbances in the earth's crust that is known to geologists. From Ma'an we proceeded past an old Roman dam, silted up and later washed out and left isolated as a meaningless wall, and on to Elji where we took horses to visit the fantastic ruins of ancient Petra (called Sela in the Old Testament). This much-discussed city was the capital of the Nabatean civilization and flourished at the same time as the Golden Age of China -- 200 B.C. to 200 A.D. Rose-red ruins of a great city are hidden away in a desert gorge on the margin of the Arabian desert. Petra is now the desolate ruin of a great center of power and culture and has been used by some students as evidence that climate has become drier in the past 2000 years, making it impossible for this land to support as great a population as it did in the past. In contradiction to this conclusion, we found slopes of surrounding valley covered with terrace walls that had fallen into ruin and allowed the soils to be washed off to bare rock over large areas. These evidences showed that formerly food was grown locally and that soil erosion had damaged the land beyond use for crops. Invasion of nomads out of the desert had probably resulted in a breakdown in these measures for the conservation of soil and water, and erosion had washed away the soils from the slopes and undermined the carrying capacity of this land for a human population. Before ascribing decadence of the region to change of climate, we must know how much the breakdown of intensive agriculture contributed to the fall and disappearance of this Nabatean civilization. The great buildings used for public purposes are amazing; temples, administrative buildings, and tombs are all carved out of the red Nubian sandstone cliffs. A fascinating story still lies hidden in the unexcavated ruins of this ancient capital. The influence of Greek and Roman civilization was found in a great theater with a capacity to seat some 2500 persons, carved entirely out of massive sandstone rock, which only echoes the scream of eagles, or the chatter of tourists. For the Lord thy God bringeth thee into a good land, a land of brooks of water, of fountains and depths that spring out of valleys and hills; a land of wheat and barley and vines and fig trees and pomegranates, a land of olive oil and honey; a land wherein thou shalt eat bread without scarceness; thou shalt not lack anything in it; a land whose stones are iron and out of whose hills thou mayest dig brass. We crossed the Jordan Valley as did Joshua and found the Jordan River a muddy and disappointing stream. We stopped at the ruins of Jericho and dug out kernels of charred grain which the archaeologists tell us undoubtedly belonged to an ancient household of this ill-fated city. We looked at the Promised Land as it is today, 3000 years after Moses described it to the Israelites as a land flowing with milk and honey. The British Mandate Government for Palestine was very accommodating and furnished an armored car to protect us in our travels against attacks of terrorists, who were very active at that time. The Government also furnished us an airplane with special permission to take pictures from the air. The Jewish Agency gave us all facilities to study the agricultural colonies. Because of this excellent cooperation, we had an excellent view of Palestine as it is today. This picture, taken near Jerusalem, Palestine, shows a contrast in slopes. 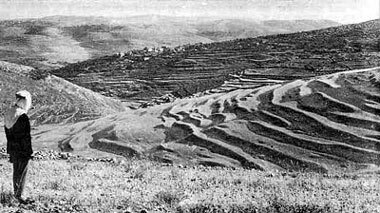 The slopes in the foreground and the left middle distance are almost completely bare of soil; while the slopes to the right where crude terraces are seen still retain enough soil to produce a thin crop of grain. We found that the soils of red earth had been washed off the slopes to bed rock over more than half the upland area -- washed off the slopes and lodged in the valleys where they are still being cultivated and still being eroded by great gullies that cut through the alluvium with every heavy rain. Evidence of rocks washed off the hills were found in piles of stone where tillers of soil had heaped them together to make cultivation about them the easier. From the air we read with startling vividness the graphic story as written in the land, where soils have been washed off to bed rock in the vicinity of Hebron and only dregs of the land are left behind in narrow valley floors, there still cultivated to meager crops. In the denuded highlands of Judea are ruins of abandoned village sites. Capt. P.L.O. 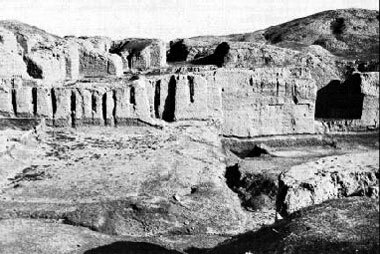 Guy, Director of the British School of Archaeology, has studied in detail those in the drainage of Wadi Musrara. These sites were occupied 1500 years ago; since that time they have been depopulated and abandoned in greater numbers on the upper slopes. Capt. Guy divided the drainage of Musrara into three altitudinal zones: The plain, 0-325 feet; foothills, 325-975 feet; and mountains, 975 feet and over. In the plain 34 sites were occupied and 4 abandoned; in the foothills, 31 occupied and 65 abandoned; and in the mountains, 37 occupied and 124 abandoned. Villages have thus been abandoned in the 3 zones by percentages in the above order of 11, 67 and 77, which agrees well with the removal of soil. It is little wonder that villages were abandoned in a landscape such as this in the upper zone near Jerusalem, where the soil, source of food supply, has been wasted away by erosion and only remnants of the land left in drainage channels, held there by cross walls of stone. This is the present-day view of a part of the Promised Land to which Moses led the israelites about 1200 B.C. A few patches still have enough soil to raise a meager crop of barley. But most of the land has lost practically all of its soil, as observed from the rock outcroppings. The crude rock terrace in the foreground helps hold some of the remaining soil in place. Where soils are held in place by stone terrace walls that have been maintained down to the present, we found the soils still cultivated after several thousand years and still producing -- not heavily, to be sure, because of poor soil management. Most important, the soils are still in place and will grow bigger crops with improved soil treatment. We also looked upon the glaring hills of Judea not far from Jerusalem, dotted with only a few of its former villages, whose terraces have been kept in repair for more than 2000 years. What is the cause of the decadence of this country that was once flowing with milk and honey? As we ponder the tragic history of the Holy Lands, we are reminded of the struggle of Cain and Abel, how it has been made realistic through the ages by the conflict that persists even unto today, between the tent dweller and the house dweller, between the shepherd and the farmer. The desert seems to have produced more people than it could feed; from time to time the desert people swept down into the fertile alluvial valleys where, by irrigation, tillers of soil grew abundant foods to support teeming villages and thriving cities. They swept down as a wolf on the fold to raid the farmers and their supplies of food. Raiders sacked and robbed and passed on, often leaving destruction and carnage in their path, or they replaced former populations and themselves became farmers only to be swept out by a later wave of hungry denizens of the desert. Conflicts between the grazing culture and farming culture of the Holy Lands has been primarily responsible for the tragic history of this region. Not until these two cultures supplement each other in cooperation can we hope for peace in this ancient land. We saw the tents of descendants of nomads out of Arabia who in the 7th century swept in out of the desert to conquer and over-run the farming lands of Palestine and again in the 12th century when they drove out the Crusaders. They and their herds of long-eared goats, often called cloven-hoofed locusts, let terrace walls fall in ruin and unleashed the forces of erosion which for nearly 13 centuries have been washing the soils off the slopes into the valleys to make marshes or out to sea. 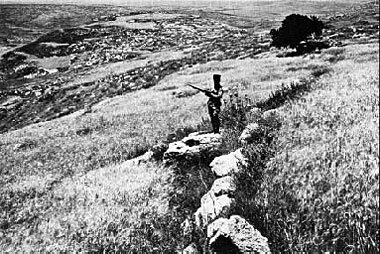 In recent times a great movement has been under way for the redemption of the Promised Land by Jewish settlers, who have wrought wonders in draining swamps, ridding them of malaria and planting them to thriving orchards and fields, in repairing terraces, in reforesting the desolate and rocky slopes, and in the improvement of livestock and poultry. The work of the Jewish colonies is the most remarkable reclamation of old lands that I have seen in three continents. Throughout our survey of the work of the agricultural colonies, I was asked to advise on measures to conserve soil and water. I urged that trees of orchards be planted on the contour and the land bench-terraced by contour plowing. So insistent was I on this point that finally we were told of one orchard that was planted in this manner. We went to see it. The trees were planted on the contour, the land was bench-terraced and slopes above the orchard were furrowed on the contour and planted to hardy trees. By these measures all the rain that fell the season before, one of the wettest in many years, was absorbed by the soil. No runoff occurred after this work was done, to cut gullies down slope and to damage the orchards below. When I asked where the man responsible for this had learned these measures, he told me that he had learned them at the Institute of Water Economy in Tiflis, Georgia, in Trans-Caucasia. We crossed the Jordan again into a region famous in Biblical times for its oaks, wheat fields and well-nourished herds, where we found the ruins of Jorash, one of the ten cities of the Decapolis, and Jerash the second. 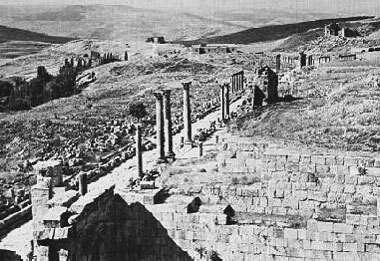 Archaeologists tell us that Jerash was once the center of some 250,000 people. But today only a village of 3000 marks this great center of culture, and the country about is sparsely populated with semi-nomads. The ruins of this once powerful city of Greek and Roman culture are buried to a depth of 13 feet with erosional debris washed from eroding slopes. Excavation by archaeologists has disclosed the beauty and grandeur of the main street of Jerash that was lined with stately columns with beautifully carved capitals for which the city was famous throughout the Near East. We searched out the sources of water that nourished Jerash and found a series of springs protected by masonry built in the Graeco-Roman times. We examined these carefully with the archaeologists to discover whether the present water level had changed with respect to the original structures and whether the openings through which the springs gushed was the same as that of ancient times. We found no suggestion that the water level was any lower than it was when the structures were built or that the openings were different. It seems that the water supply had not failed, but when we examined the slopes surrounding Jerash we found the soils washed off to bed rock in spite of rock walled terraces. The soils had been washed off the slopes and lodged in the valleys, there to be cultivated by the semi-nomads who lived in black goat-hair tents, whereas in Roman times this area supplied grain to Rome and supported thriving communities and rich villas, ruins of which we found in the vicinity. Further to the north near Hama, we came to an area of gently sloping lands in Syria where wheat is still grown after thousands of years of cultivation. Mr. Hibrani, an Arab gentleman farmer who seeks to put modern farm machinery to use on his large holdings with poor success, told me this story: Some time ago an Arab land owner sent his son to a modern university to learn the law. After graduation the son did not find the law to his liking and returned to his father who made him overseer of the threshing floor. The son was watching the two piles of threshed grain grow equally, one for the landlord, the other for the tenant. Then he asked the tenant, "What becomes of the straw?" The tenant replied, "The tenant gets all the straw." The lawyer son then commanded the tenant, "Next year you are to plant only wheat, but plant no straw." Tillers of soil have been exploited since slavery was invented in Egypt, and they in turn have exploited the earth. In the alluvial plains along the Orontes River agriculture supports a number of cities, but much reduced in population from those of ancient times. Water wheels introduced from Persia during or following the conquests of Alexander the Great (300 B.C.) were numerous along the Orontes -- hundreds, we were told, in Roman times, but today only 44 remain. They are picturesque old structures both in their appearance and in the groans of the turning wheel as they slowly lift water from the river to the aqueduct to water the city of Hama. These wheels are more than 2000 years old, but no part of the wheel is that old, because the parts have been replaced piecemeal many times through the centuries. Still further to the north in Syria, we came upon a region where erosion had done its worst in an area of more than a million acres of rolling limestone country between Hama, Aleppo, and Antioch. French archaeologists, Father Mattern and others, found in this manmade desert more than 100 dead cities, and called it "cent villes mortes," or a "Hundred Dead Cities." Butler of Princeton rediscovered this region a generation ago and aroused interest in the area. These were not cities as we know them, but villages and market towns. Here by field examination at Bare and Hirbet Haas we found that soils had been washed off to limestone bed rock to a depth of from 3 to 6 feet. The ruins of these towns were not buried as other ruins such as we saw elsewhere, but were left as stark skeletons in beautifully cut stone, standing high on bare rock. Measurements from doorsills to the foundation rock indicated that soils to a depth of 3 to 6 feet had been washed off and swept away in winter floods, leaving a region of ghost cities. Here erosion had done its worst. If the soils had remained, even though the cities were destroyed and the populations dispersed, the area might be repeopled again and cities rebuilt. But now that soils are gone, all is gone. Ruins of one of the Hundred Dead Cities of Syria. From 3 to 6 feet of soil have been washed off most of the hillsides. This city will remain dead because the land around it can no longer support a city. We are told that in 610-612 A.D. a Persian army invaded this thriving region and less than a generation later, in 633-638, the nomads out of the Arabian desert completed the destruction of the villages and dispersal of the population so that all the measures for conserving soil and water that had been built up through centuries were allowed to fall into disuse and ruin; then erosion was unleashed to do its deadly work in making this area a manmade desert. From the air we got a vivid idea of what had happened to the villages of this area where a civilization of an unusually high type had grown up and developed a distinctive architecture. It was a Christian civilization with great churches, ruins of which are still seen in Bare. We saw Christian symbols carved into stone doorposts indicating that the householders were not ashamed to confess their faith, and we saw the ruins of many Christian churches.